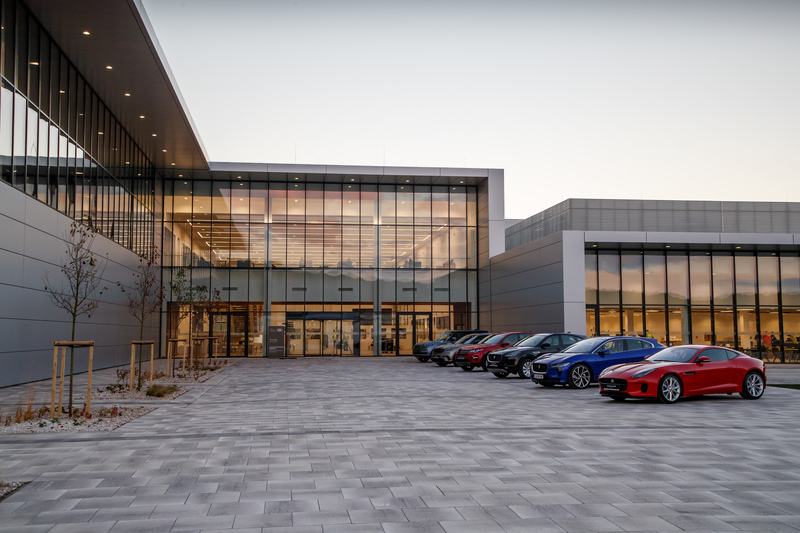 Wednesday 31st October 2018, Nitra: Jaguar Land Rover today opened its state-of-the-art €1.4bn (£1bn) manufacturing facility in Nitra, Slovakia, the first time a UK automotive company has opened plant in this country. With the heart and soul of its business in the UK, Jaguar Land Rover's investment in Nitra marks the latest step in the company's global expansion strategy following the opening of its Chinese joint venture in 2014 and Brazilian plant in 2016, supported by contract manufacturing in India from 2011 and Austria from 2017. The creation of new international factories allows Jaguar Land Rover to offer its customers even more exciting new models, protect against currency fluctuations and support a globally competitive business. At today's ceremony, Prof. Dr Ralf Speth commented: "Global businesses require global operational footprints. While Jaguar Land Rover's heart and soul remain firmly anchored in the UK, expanding internationally onlyenriches and strengthens our UK business. Today's opening of our next generation manufacturing plant in Nitra, Slovakia represents the start of a new era in manufacturing for Jaguar Land Rover. It is the latest milestone in our long-term globalisation programme and the culmination of four years planning. As with our existing manufacturing facilities located in the UK, China, Brazil, India and Austria, this high-tech plant in Slovakia will complement and support our corporate, R&D and engineering functions headquartered in the UK." Jaguar Land Rover currently employs around 1,500 people in Nitra, 98 per cent are Slovak nationals and 30 per cent are women. It will launch its second phase of local recruitment in November looking for an additional 850 people to join the world-class team in Nitra. All manufacturing employees have taken part in a bespoke 12 week training programme in the company's first overseas Training Academy, representing an investment of €7.5 million. Professor Dr Speth continued: "Our diverse workforce brings a wealth of experience from both automotive and broader industries. I am delighted to officially welcome our Slovak team to the Jaguar Land Rover global family today." The new 300,000m² facility stands at the forefront of aluminium manufacturing and engineering expertise in Slovakia, with an annual capacity of 150,000 vehicles a year. Supporting the company's on-going commitment to deliver high technology lightweight vehicles to its customers, the first Land Rover Discovery rolled off the production line in September. The plant incorporates cutting-edge technologies and it is the first in Europe to use Kuka's Pulse carrier system which is 30 per cent faster transfer times than conventional conveyance systems. It will also feature a highly automated paint shop process to ensure the highest quality and minimise the environment impact. Looking to the future, the factory has been designed with the flexibility to enable smart, connected manufacturing technologies, such as shop floor visualisation by using real time data to solve issues which will support improved process efficiency, delivery and quality. Slovakia has an established premium automotive sector, which represents 44% of the country's overall industry. With an established network of suppliers in close proximity, Jaguar Land Rover has sourced and localised a number of components, such as seats and wheels, to support production of the Land Rover Discovery in Nitra delivering several thousand additional jobs in the automotive supply chain in Slovakia. Jaguar Land Rover works closely with the communities near to its manufacturing plants around the world. In the last six months, Jaguar Land Rover has delivered almost 500 volunteering hours to projects in Nitra and surrounding communities; launched its first employee grant programme supporting 12 local projects, including Nitra's first therapeutic sensory room, and most recently has opened a new endowment fund, in conjunction with the Pontis Foundation, to support local projects in the future. Over the course of the last three years, Jaguar Land Rover has delivered new education programmes to inspire the next generation of automotive engineers in Slovakia. In November, the Land Rover 4x4 in Schools competition will be held in Slovakia for the third year. 10 schools from Slovakia will take part in this year's competition to design and build a remote control four wheel drive vehicle capable of tackling tough off-road test tracks. In addition, Jaguar's Primary School Challenge will be held in Slovakia for the first time this year. These programmes are designed to bring the world of work to life as well as increasing awareness of the range of careers available to young people. Europe has the largest number of Jaguar Land Rover retailers with almost 800 outlets across 42 countries. Since the beginning of 2018, Jaguar Land Rover has sold more than 94,000 vehicles in Europe. The UK is the cornerstone of Jaguar Land Rover's business and remains at the centre of Jaguar Land Rover's design, engineering and manufacturing capabilities. Over the past five years, Jaguar Land Rover has employed more than 20,000 people taking its workforce to almost 40,000 in the UK. It has invested more than £12 billion in new product creation and capital expenditure. During this time, the Company has invested heavily in its UK vehicle manufacturing facilities at Castle Bromwich, Halewood and Solihull to support the introduction of all-new vehicles such as the Jaguar XE, Jaguar F-PACE, Range Rover Evoque Convertible and Land Rover Discovery Sport. It has doubled its investment in its engine plant in the UK to almost £1 billion – the largest injection into a new British manufacturing plant in decades creating several hundred new jobs. At Jaguar Land Rover, we are driven by a desire to deliver class-leading vehicles, which will provide experiences our customers will love, for life. Our products are in demand around the globe. Jaguar Land Rover today opened its state-of-the-art €1.4bn (£1bn) manufacturing facility in Nitra, Slovakia, the first time a UK automotive company has opened plant in this country.